Knowing what you can and cannot do with a property is one of the most important aspects of residential real estate. Which is why property setback exists. Architects and developers are well aware of the vital role it plays. Realtors, though rarely grilled on setback requirements the way they are about bedroom sizes and school districts, are just as keen to have this information handy as it shows a level of expertise any potential homeowner would value. But what exactly is a setback? Unless you are a real estate pro the answer is not so obvious. Few homeowners rarely give property setback much thought. Then one day they want to remodel and BAM! they are knee deep in building codes and local ordinances they never knew existed. The problem is getting details on property setback can be a real pain, and time consuming. Often it requires hiring a property surveyor or digging through municipality zoning records, which is as awful and boring as it sounds. There is a much easier way to get this data, but before we go into that let’s first get a better understanding of setbacks. A property setback is a real estate requirement that prevents a homeowner from building a structure too close to a neighbor’s property. If someone wants to add a shed, or put on an addition, they won’t be able to do so if it encroaches too close to the adjoining property lines. That’s the short it. Now for the rest. Setback requirements come into play most for those living in highly-populated neighborhoods and cities where a shortage of available space is a way of life. In the City of Los Angeles most structures cannot be located right on a property line and must be set back a certain distance. Sounds simple enough, but anyone whose had the unfortunate pleasure of combing through the City of Los Angeles’ zoning codes knows it is anything but. These dimensions are the setback requirements. There are exemptions to the standard setback requirements. There are also a whole lot of other factors ultimately influencing the buildable area of a property. For example, fences are exempt from normal setback regulations and can be built practically anywhere so long as they are within a certain height. Decks, porches, and detached garages are other examples, to a certain degree. The size and location of a property also plays a role. Whether you’re on a Hillside, Coastal Property, Historic Zone, Key Lot, Through Lot, or Corner Lot will all affect the required dimensions. For instance LA zoning codes for R1 Hillside homes require the front yard setback be a minimum 20 percent of the entire lot depth and a maximum of 20 feet. As you can see below, that’s just one of the revisions to take into consideration for a Hillside home. And that table doesn’t even take into account a third caveat in the code that often requires front yards match the “prevailing” setback of the surrounding neighborhood. A prevailing setback refers to an ambiguous setback figure used to define the front yard regulations for R1, R2, RA, RE, and RS zoned lots. The City of Los Angeles determines a prevailing dimension by measuring the front yards of all the other houses on a block and comparing them against one another using a seemingly contrived formula. It’s incredibly confusing and complex. The purpose of a prevailing setback is to guarantee that a property will retain the existing character and aesthetic of the area by being visually consistent with everything else around it. An online calculator provided by the City can help figure out what the prevailing setback number might be for any given property. A setback variance allows a property owner to build within a setback zone, despite the ordinances saying they cannot. If someone believes a setback requirement unfairly restricts their property rights (e.g. their right to build where they want) they can petition the local government municipality for an exception, aka code variance. Though don’t get your hopes up, variances are not easy to obtain. Zoning boards rarely grant setback variances save for cases of extreme hardship imposed on the property owner. No matter what, before someone can fight for the right to build where they want, they need to first have all their facts straight, knowing what current zoning codes allow. But since there are a mind numbing number of variables to take into account, the allowances are not always easy to ascertain. Which is why you can forgive someone for throwing in the towel and wanting nothing to do with setbacks at all. Not knowing the correct property setbacks can be very costly. If someone goes ahead and builds a structure or makes an addition without taking these requirements into consideration they will be subject to severe penalties by the City. These can include hefty fines, or being forced to tear the structure down without compensation. Even if the City doesn’t get involved, neighbors whose property line are being encroached can sue. So the best thing to do is know from the start exactly what can and cannot be done with a property. All our UnderBuilt Property Reports provide the setback requirements for a lot, covering the front, side, and back yards. By simply searching for an address or APN in our system, the report is instantly compiled, generating one of the easiest and quickest ways out there to ascertain property setback. You’ll notice at the bottom of this report (which just so happens to be the home of Jack Nicholson) each yard’s setback requirement is explicitly defined. Should Jack want to make any more additions to his estate, he can use this as a reference in helping determine just how close to his property line he can build. The minimum Jack’s side yard can be is 10 feet so long as the nearby building is not over 18 feet. If the building’s height exceeds 18 feet then that minimum setback increases. Specifically, it increases by 1 foot for every 10 feet that he builds over 18 feet. For example if his home was 28 feet, his side yard would have to be at least 6 feet. If his home were 34 feet, his side yard would have to be at least 7 feet. The same rules that apply to Jack’s front yard also apply here to his backyard, without having to take into account the Prevailing Setback. When trying to figure out what you can and cannot do with a property, the best place to start is with one of our UnderBuilt zoning reports. 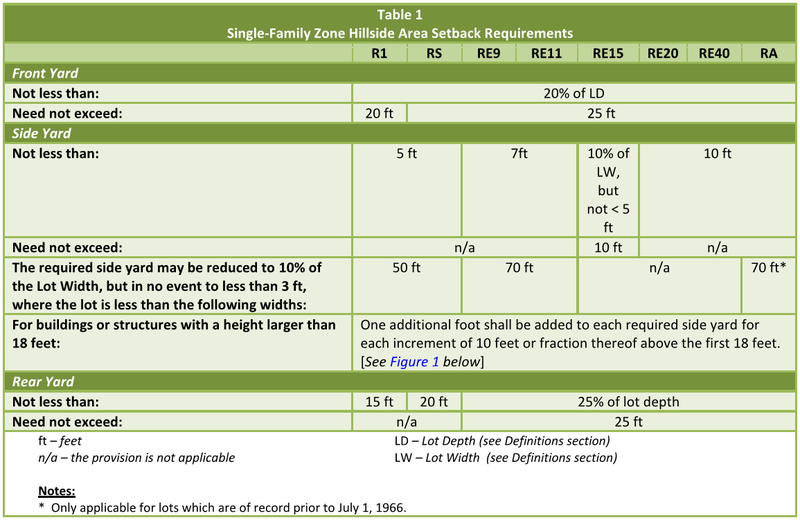 Since things are always changing it is best to double check these numbers with local zoning boards, but as they are, instantly compiled by our system, these property setback dimensions provide a great resource for realtors, architects, developers, and homeowners alike. And of course should you ever have any further questions about setbacks, you can always contact us using the orange Chat Box in the corner of the screen.